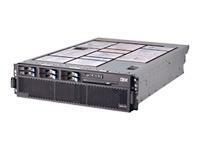 The IBM System x3850 Series delivers outstanding performance, extremely low latency and high availability and manageability along with advanced, integrated technologies that help protect your IT investment. The x3850 is designed with IBM X3 Architecture, the third generation of mainframe-inspired IBM Enterprise X-Architecture Technology, and 64-bit Intel Processors. Driving mission-critical applications including Enterprise Resource Planning, database serving or custom-developed, Java technology-based applications like IBM WebSphere software, the x3850 excels at performing transaction-intensive, back-office functions.